The MBA in International Hotel Management combines a university teaching approach with a professional edge, whose aim is to train operational and higher managers in the field of hospitality with a wide range of equipment and facilities pertaining to international companies. 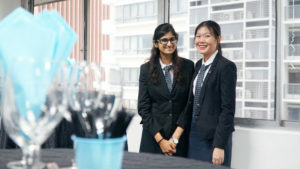 Industrial attachment aims to expose the student to live experience and operations in the hospitality industry as an intern to prepare him/her to undertake supervisory roles after graduation. During this stage of industrial attachment, the student will be evaluated on his/her effectiveness in applying theories, mainly supervisory and management concepts, learned in school and enrich his/her skills and knowledge by immersing himself/herself in the workplace. The student will be required to submit a paper that would lay-out a plan to improve company’s business operations or any specific organisational function. The plan should include a situational assessment and the corresponding suggestions and recommendations. It will be undertaken for a minimum period of 6 months. industrial attachment is compulsory for Full-Time students. Part-time students with extensive working experience in hospitality industry can apply for exemption, subjected for approval, for this module. The intake for the Full-time program is three times a year. The intake for the Part-time program is currently not available. The students carry out marketing and communication actions .They learn how to organize a meeting and debate on the corporate strategy in the language studied. This course targets economic laws. Brand law is studied as it was in the marketing course, and the right to competition as a complement to economics and corporate strategy. Students will not be trained to become experienced legal experts, but will be initiated in complex legal concepts with a very strong international outreach. This module allows students to prepare themselves for the final GSP exam and to be introduced to entrepreneurial work. Students are introduced to corporate finances though strategic decisions and act as if they were the financial manager. They are introduced to key financial themes through case studies and must use the knowledge acquired in previous years. A correct presentation of the dissertation is nearly as important as the content. Quality is much more important than quantity. In the oral presentation, the student puts himself in the position of the consultant who just has few minutes for his pitch with one of the senior manages of the company, or with a banker, with a pertinent project that needs either to be financed or implemented. This manager or this banker knows nothing about the project before you present it to them. Thus, the jury or dissertation panel will grade the oral presentation according to pre-set criteria. Depending on the theme of the dissertation chosen by the student, a masters Vatel professor teaching in one of the fields that has been chosen and an external professional (usually one of the host company managers) will be chosen by the student to accompany an guide him in his work. These people will also be asked to participate in the jury for the dissertation examination. In order to optimise this time of assistance for all students, a time period will be allocated to each professor that has been chosen to assist in the dissertation. The assistance can have several forms: face-to- face talks, meeting, emails, etc. unicator, and financial audits. Students are initiated to financial analysis by manipulation known or new notions which allow them to make a diagnosis of a company and learn its value. They learn how to make the right choices in terms of investment and a financial plan. Students deepen their knowledge in taxation and study the consequences it has on a company, both in terms of human resources and in terms of the activity and the equity the company itself holds. They are introduced to a few notions of international taxation with group operation taxation. The students are introduced to management actions in a foreign language. They learn how to affirm their leadership by mastering a foreign language in their working relationships. 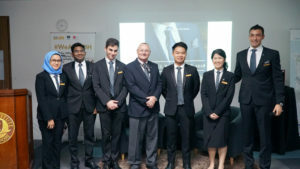 The goal of this course is to teach students operational expertise and leadership which they must have to take the right managerial decisions when running a department in a hotel. Students are invited to think of a global HR strategy. They begin to acquire the skills and knowledge required to work in the human resources department in an international hotel chain. The hospitality and tourism sectors are currently undergoing deep changes. In this course, students will understand the new challenges that this field must and is going to take on as it reinvents itself. Students will apply their knowledge in computer software to the tourism and hospitality sectors. They will create a web site using WordPress. Students are invited to use the marketing concepts acquired during previous years to define a marketing strategy. Their vision changes as compared to the operational vision they had in their Bachelor’s or Foundation Year. They gain additional knowledge in terms of using social networking in corporate communication. They are introduced to revenue management. This module aims for the student to become familiar with the principles of IBN (Interest- Based Negotiations). The students at the end of the module should be able to use the principles in different contexts as follows: commercial negotiations, social negotiations, and managerial negotiations. The module covers topics like defining negotiations, objective definitions, guidelines and strategies, sales negotiations from planning to evaluation, agreements, conclusions and consolidation. This module helps students to deepen their managerial knowledge in auditing and managerial controls acquired in their third year (M3 or Foundation Year). It also allows students to acquire the skills required to work as a management auditor or a profit center manager. Students are placed in the position of a high-level manager and understand the various corporate strategies in place. They learn how to analyze their economic environment both internally and externally using matrix tables and diagnostic methods. Students have acquired knowledge and strong skill sets in HR management. This course allows them to act as the HR manager in a hotel. They apply their knowledge in team management to a support and transversal department which is the HR department. 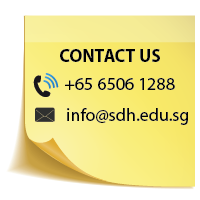 The students are introduced to communication and marketing with a strategic and decisive point of view. They learn how to analyze a marketing situation that will allow them to decide whether or not to put in place a communication, marketing or advertising strategy. Students are confronted with strategies employed by hospitality professionals throughout the world to ensure their development. They compare these strategies to the tourist economy in geographical zones mentioned and hone their critical spirit when considering decisions taken.They are able to compare them with strategies in independent hotels. The students carry out marketing and communication actions in a foreign language.They learn how to organize a meeting in the language studied. 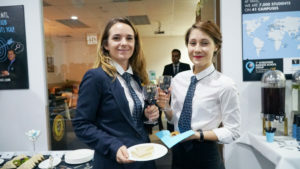 The Vatel International Business Game (VIBG) is a real-life simulation of management situations taking place in an international hotel and now is an important part of the Vatel curriculum. Students are a part of “executive management teams”, and must manage three companies belonging to the same group, the Vatel Holdings, which is at the same time the sales and marketing headquarters plus the financial holding for the group; Vatel City which is a 4-star- 300-room urban hotel in Paris; Vatel Resort which is a 5-star- 150-room seaside complex in the Vatelle Archipelago in the Indian Ocean. At the end of the game, the best group is named as the “Vatel Dream Team of the Year. The main purposes of the games are to create the atmosphere of running a hospitality company, to develop teamwork, and make interdisciplinary and global decisions, among others. Each student will go through a six-month industrial attachment. This is yet another opportunity to display the learning evidences not only in class but also in practical performance. During and before the finishing the industrial attachment, each intern will be evaluated to determine the extent of learning and qualifications of such intern. The student is expected to gain the confidence to be fully employed after this stage. Get Your MBA in International Hotel Management! Start Your MBA in International Hotel Management Journey Today!